This project is the first of it’s kind to take the traditional technique book publication that all musicians are so used to, and using technology available to us today, enhance it to include videos and audio of what different exercises are supposed to look like, all presented by a world-class performer and pedagogue. Though this format has some limitations, it also presents us with many new opportunities to teach and present an incredibly useful and unique approach of double bass playing to the world. The Canadian School of Double Bass electronic book was created out of necessity - the double bass player is in perhaps the most difficult situation when it comes to traveling in order to learn, as it is either dangerous and expensive to travel with a bass, or perilous to borrow an instrument of satisfactory quality in a strange place. The contents herein are basically the previously published Daily Exercises for Double Bass book with added information and multimedia. We hope that you will enjoy this format, and invite you to visit www.joelquarrington.com as well as www.facebook.com/quarrington to give feedback, make requests, and check up on new releases of material. 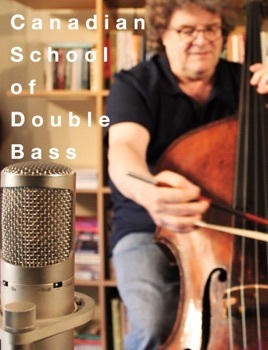 Though this book may go farther than any book has before in providing accurate instruction on how to play the double bass, it’s creation was never meant to take the place of one-on-one study, which is one of the most cherished traditions that the classical music world provides. This is the definitive technique book for anyone looking to use fifths tuning on the double bass!